In 1853, U.S. Commodore Matthew Perry (no, not the Friends actor) sailed to the shores of Japan to strongly suggest (with several gun-laden vessels) that the ruling shogunate open Japan’s ports to outside trade. For 200 years, Japan had embraced a policy of near total isolation from the West, but with the Industrial Revolution fresh out of the oven, even isolationist Japan couldn’t ignore the benefits of trade. What does this history lesson have to do with Product Managers and Customer Success? In most companies, each department is like its own, relatively isolated shogunate. Each manager has his or her patch of office space to rule, and each kingdom is somewhat suspicious of its neighbors. Take Sales and Marketing for example – a Corporate Executive Board Survey cited in Hubspot’s “The Power of Smarketing” revealed that 87% of the terms Sales and Marketing use to describe each other are negative. I would venture to say that the feelings of Product Managers towards Customer Success Managers are neither warmer, or fuzzier. After all, as Product Manager, you’ve developed a product that works – why should it be your problem if buyers can’t figure out how to use it? Nobody is going to hold a 19th century Paixhan shell gun to your head (they’re far too heavy), but opening your borders to Customer Success is the only way you’ll survive and thrive. Here’s why you, as Product Manager, should embrace Success. All across the SaaS B2B industry, this new and vital discipline is being developed. CSMs are charged with optimizing customer relationships, increasing product adoption and reducing churn. In product development, there’s a phenomenon known as the “product death cycle,” when puzzled business owners make the mistake of asking customers “why aren’t you using my product? What features do you want?” and act accordingly, falling into the “next feature fallacy.” The first nail in the coffin is asking every customer for input. The second nail in the coffin is listening to them. Of course, you should listen to what your customers want – that’s how you achieve product-market fit. But, you can’t listen to everyone. To build a successful product, you need to base it on what your ideal customer needs. 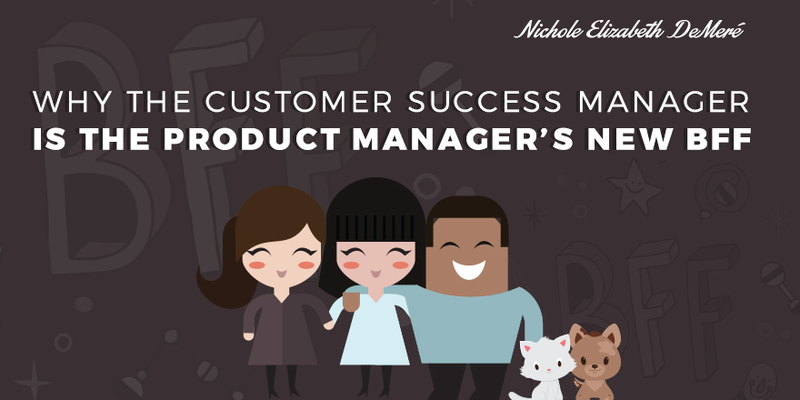 Part of the customer success manager’s job is to ensure the entire company is aligned around an ideal customer so that everyone, no matter their department, can help attract and retain them. For Product Management, this means that only feedback gathered (by the CSM – or by the founder who is doing Customer Development) from ideal customers – those who are ready to love the product and find real value in it – will be delivered. No more pages of feedback from customers who don’t know what they want (but you’re not it). No more trying to please everyone (and pleasing no one). With feedback gathered only from ideal customers, Product Managers are able to prioritize features and create a living product road map. Customer success helps product managers ensure that the onboarding process is founded in what customers need to achieve their desired outcomes. When the onboarding process is optimized to give each customer segment everything they need to set goals, track goals, and achieve goals, retention rates soar (and do so far past the typical drop-off points of 30 and 60 days). But product developers won’t know by osmosis what customers need built into their onboarding experiences to be successful – which is where customer success comes in as an integral partner. The Net Promoter Score (NPS) survey is an incredibly useful tool for uncovering what makes a product a “must have.” Though sometimes handled by Product Development or other departments, Customer Success may also implement Net Promoter Score surveys to metricize customer happiness and provide ongoing qualitative feedback. NPS results can then be used by Product Managers to give the product development team insights into which aspects of the product could be improved, which retain customers, and which lead to up-sells and cross-sells. Just like onboarding, when a prospect achieves success with a free trial, they’ll be more likely to convert into paying customers. When customer success teams correctly identify what success means to prospect segments, the product development side gets the information they need to optimize free trial experiences accordingly. The result of product development informed by customer success data is higher retention (aka. reducing churn). But successful customers don’t just stay, they talk. They share what works for them with their friends and colleagues, resulting in cross-sell opportunities and referrals, all of which reduce cost-to-acquire (CAC) and increase profitability. The weight of customers finding success (or failure) has sometimes rested on the product management side – via answering support tickets and questions, or getting roped into customer support for anything and everything “technical.” Customer success can lighten the load by providing educational materials that help customers find success both inside and outside of the product. “Wait – success outside of the product?” you ask? This is an idea that’s been encapsulated in the phrase “the success gap” – it’s the gap between people using a product, and their real-world outcome. For example, AdEspresso is a platform for Facebook ads, but success for their customers isn’t the act of placing an ad on Facebook – it’s when people make purchases via those ads! And that requires more than simply posting an ad; it requires visual design, content strategy, landing page strategy, and knowledge of how the buyer funnel works from Facebook ad to “Buy” button. Even though this isn’t what pays the bills at AdEspresso, they’ve taken it upon themselves to educate their consumers with the AdEspresso Academy. They teach their users how to create effective ads, closing the success gap between their in-product experience and success in the real world. Smart businesses go one step further by keeping track of individual customer success benchmarks, so customer success agents know when a customer is bridging the “success gap” or falling through the cracks. Then, customer success teams can preemptively answer questions and find solutions before those questions ever reach Support or Product Dev. Product Managers may think that if users complete the functional aspects of the product, they’ll be “successful.” Well, with the “success gap,” that clearly isn’t always the case. Customer success can help with this by using customer support tickets to uncover gaps in how and why customers aren’t finding success with the product. These insights can help Customer Success, Service, and Product Development find out whether there are functional reasons or educational reasons behind these gaps and create a better overall user experience. What can we do to help our customers achieve success? It’s the defining question for Customer Success advocates, but it should be the defining question for every person and department within a SaaS company. When all parties are aligned under that goal, it’s not only the customers who achieve success – you do too.